I have another great Back To School product to review and Giveaway! Look at this beautiful bag that Joanna at All About You Design made for my daughter. She actually Monogrammed her name on it. Maddie was so excited when it came in the mail. I had to pry it from her hands so that she wouldn't ruin it before she even started school. She is so proud to wear it to school every day. I love the fact that she doesn't have the same backpack that all of the kids have. A lot of the Kindergartners have the big hard plastic bags that look too big and uncomfortable. This bag is soft and fits Maddie perfectly. The best part is that Joanna actually makes these bags in three different sizes so you can fit the backpack to the child. 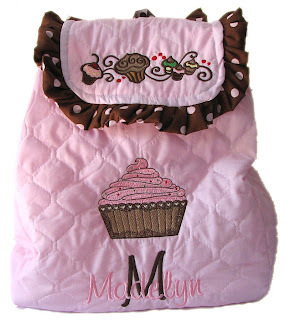 She has so many different designs and she monograms them. They are all so cute! We have gotten so many complements on her bag so far and it is only the second week of school. I am so thankful to Joanna for giving this bag to Maddie. She was so excited to carry a new book bag to school this year. Make sure you click here to check out All About You Design. Joanna has so many unique products to choose from. She has belts, Monogrammed baby gifts, Flip Flop Straps, Mommy and Me bags and so much more. You are going to love her shop! You can also click here to view her Etsy shop. 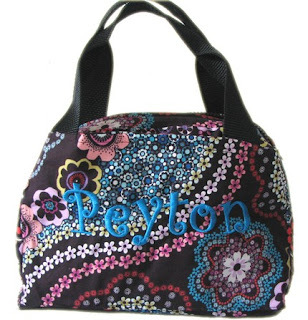 All About You Design is Giving Away a Quilted Black Lunch Bag with Monogram to one Lucky Reader! This is a sample of the giveaway. The actual prize will be black. 1. Visit All About You Design and come back and leave a comment sharing with us your favorite item. 2. For a second entry "Like" All About You Design on Facebook by clicking here and then leave me a comment telling me you did so. This review is my honest opinion of All About You Design. I was not told or paid to say anything in this post. I am not responsible for any prizes. The first item that popped up, the flip flop straps are just awesome! I was looking on the website and I just love the customized personalization. I have a baby shower to go to in a few weeks and the babies name is not very common and I think I might purchased soemthing with her name on it. I love the teddy bear ballerina backpack. I liked the facebook page on facebook. i 'like' all about you design on facebook. the design your own flip flops are an awesome idea! very cool! Hi Jessica! I love your blog!! That bag is so cute... but even more great... you look AMAZING!! Your last picture up there is smokin'! Anyway, My favorite item on the All About You Design site is the mommy and me bermuda bags. I liked them on facebook. I friended you on facebook. I became a follower of your blog. Yahoo! Thanks for hosting a contest! I love the duffel bags. They'd be great for weekend trips. Really cute! I really like the cute duffel bags and the flip flops! I love the lunch bag's - Sandy V.
I'm your FB friend! - Sandy V.
I'm a follower! - Sandy V.
I liked All About You Design on Facebook . My favorite item is the Ballet Toe Shoes Embroidered Jr. Duffel. I love the duffel bags! That would be wonderful for all our long trips!